Embed Private Youtube Video - What Is Embed Private YouTube Video? What Is Embed Private YouTube Video? As you already know, it is possible to embed only unlisted or public YouTube videos on a website. Links to these videos, however, could be freely shared and anyone with a link can watch them. Embed Private YouTube Video is a service that enables you to embed a private YouTube videos on your website. Providing this, it prevents your website visitors or registered users from freely sharing your valuable YouTube videos. Whether you are building an online course website, a membership website with restricted video content, an eLearning platform, or you create video art and you are hosting your videos on YouTube, this service is right for you. If you want to embed YouTube videos on your website while making sure that no one besides your users will be able to watch them. What are alternatives to Embed Private YouTube Video? Most known alternatives are Vimeo PRO, Wistia & VdoCipher. 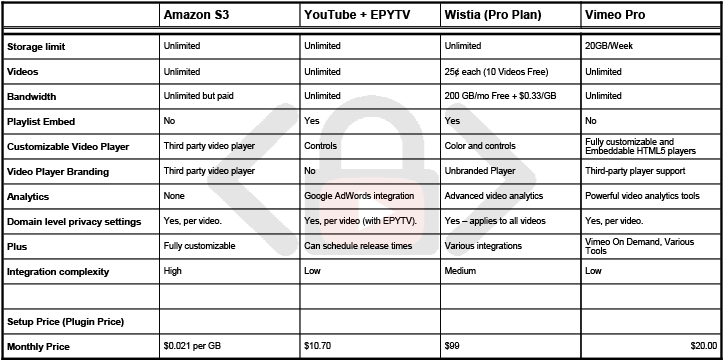 See following comparison table of most known services for hosting and embedding videos.